Despite how much I detest Dragon Song I do love a lot of the sprite work when it’s not looking all stretched out and strange. However there’s one sprite they have in the game that I just absolutely adore since it reminds me of the older Lunar game sprites. 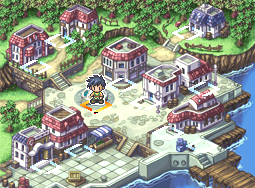 It only appears though when moving Jian around place-to-place on the maps. Here’s a picture for those of you who haven’t placed DS/Genesis. Anyways seeing how it puts me into nostalgia I decided trying my hand at re-creating the Lunar characters from past games in that style. So far this is what I have. As always you can also find these over on my spriting blog. This is the coolest thing Dragon Song related. I love it!